Once located at the top of Toothill Lane, the now demolished Toothill Grove was built in 1805 and enlarged ten years later. By the Edwardian period the house was occupied by the Eastwood family and in 1910 it was the scene of a tragedy when Olive Eastwood, the popular daughter of the family, was discovered dead in the summer house, having taken her own life. Some weeks previously she had fallen from her bicycle and suffered a concussion which resulted in bouts of depression, leading the inquest returned a verdict of “suicide whilst the balance of the mind was disturbed”. 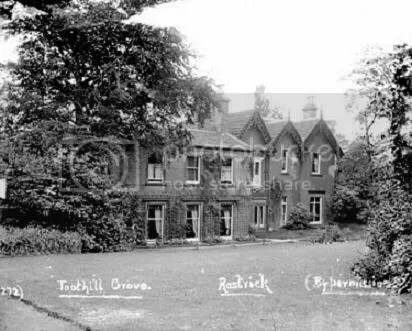 For many years after her death, until the demolition of the house in the 1960s, the girl’s ghost was believed to haunt Toothill Grove. The story was given credence by the fact that a blind appeared always to be drawn in one of the upstairs windows, said to be that of the bedroom of the dead girl, now never used. However, in an article for the Brighouse Echo date 18th August 1995, local history correspondent “Rowan” assures readers that it was in fact merely a dummy window installed for the purposes of symmetry and there was nothing behind the blind at all. Although this is a somewhat prosaic and effectively debunked story, it illustrates how local tragedies and seemingly mysterious old buildings can quickly enter local folklore. The article in the Echo was prompted by an inquiry from a reader who had heard the house was haunted in his childhood but had no idea of the story behind it. Had Toothill Grove not been demolished it would probably still today have enjoyed a reputation as a “haunted house” in the oral tradition of local children, even without an attached narrative. All neighbourhoods have such buildings after all. However, belying this prosaic naturalistic explanation, are the experiences of the woman who currently occupies a house built on the site of Toothill Grove. During alteration work, she discovered a concealed room behind the bathroom wall, since which time she has heard mysterious knockings in that part of the house and often seen a grey shadow in the corner of the room or on the staircase. She now wonders if the position of her bathroom might correspond with the former position of the bedroom in which Oliver Eastwood committed suicide. I currently live on this plot of land, and late at night if im in what is now the upstairs bathroom i sometimes hear a knocking or banging on the door. Also i have seen what looks like a grey/clear shadow in the corner of my bedroom (next to bathroom) and on the staircase. Just to note that the bathroom hasn’t always been there and when my dad knocked through the wall, there was a room on the other side. I have heard of three different suicides in this house, one of a girl throwing herself from an upstairs bedroom window, then the room being locked and never used again. When the house was rebuilt, could this be where my bathroom is? Thanks for your comment, Jodie. Maybe the haunting isn’t as “debunked” as the Echo correspondent believed it to be. I don’t honestly know if your bathroom may have corresponded with the room in question, but if you looked at the deeds of conveyance for the land, it might be possible to work it out. Dear Sir, I am a collector of antique photographs, pre-1900, I’ve been collecting for 40 years and my collection has some English daguerreotypes, ambrotypes and albumen photos! Recently I acquired an image from a person here in the States, (Illinois) a 1/4 plate ambrotype image of an English house 1857ca., on the reverse side of the image was written in pen “Toothill Grove”. I googled the name to see if I could find out any information, a wild stab in the dark, not thinking that anything would show up. But I was surprised when your site appeared along with a photo of the house, from 1910. You can see it is the same house, and you can see the renovations made to the building over 60 years between photos. The second story on the right of the image shows major design change in the roof. Three gable type dormer sections were added, also the windows in the house appear to have replaced with large pane glass windows. I thought you might be interested in the image, sent 2 files to your gmail address! If interested drop me a line at dsml.gulledge@comcast.net!